I learned how to make a terrine last semester in Chef Ray’s class at ARC. Since my dad bought me a terrine mold for my birthday, I was anxious to try to make another at home–but since it is quite an ordeal, I needed to wait for precisely the right event. Like a dinner party where all the people are food-crazed maniacs. Luckily, the opportunity presented itself last week and I rolled up my sleeves and got to work. First thing’s first. Put your meat and the grinder attachments in the freezer for a while. 20 minutes should do it. You want everything COLD! You don’t want the fat to melt or for the meat to get warm because it will get everything gunky. It helps if you have a meat grinder attachment for your Kitchenaid Mixer, or a manual meat grinder. If not, ask your butcher to grind the meat for you, or chop it by hand. Do not buy pre-ground meat for this. Here are all the other ingredients you’ll need. I know, it’s a lot! First, cut all your meat into chunks, so you can feed it through the grinder. I didn’t have exact measurements from the butcher, so I weighed it. Next, cut up your fatback. Terrines, like any pate or sausage, need fat. This is good Berkshire pork fat that I got at my beloved Corti Bros. It cost me a whopping 72 cents. Add it to your other chopped up meat. Next up, everyone’s favorite, chicken livers! Now, don’t be scared, just pry a few out and toss them in with the chopped meat. Put the meat back in the freezer and put your grinder together according to your mixer’s directions. Or, if you are like me, just figure it out because the directions are long lost. Use the grinder thingy with the smaller holes. Position a bowl with ice underneath with another bowl inside to catch your ground meat. Start grinding! Go slow at first, and just put a handful of meat, fat and liver in at a time, pushing it down with the wood pusher thing. It’s kind of exciting watching it come out. Here’s your finished ground meat product. Looks like sausage, right? Now put it back in the fridge, just keep it on the ice. Saute some onion, and add the garlic and thyme. Cool that on ice, too. This recipe uses a lot of bowls. Thank you science, for dishwashers. Next, you are going to pulse up your salt, black peppercorns and spices in a mini food processor or a spice grinder. Add to onion mixture. Add cream, eggs and brandy. These are green peppercorns, and I really love them. They add a special something to a terrine. Add ground meat, cubed country ham and peppercorns to the cream and onion mixture and combine well. Use your hands but try not to overmix it. Heat up a cast iron or nonstick pan and put a blob on and cook it through. You have to test it for seasoning. Does it need salt, pepper, anything? Because now’s the time to add it if it needs adding. Eat it. Share some with your offspring for a second opinion. Now it’s time to prepare your terrine mold. Get some thin sliced bacon and line the terrine with strips, crosswise. Do not overlap the bacon. Fill with the ground meat mixture. 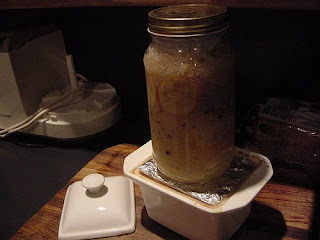 Pick up the terrine and bump it on the countertop a few times, to help release any air bubbles and to pack it down. Smooth the top. Fold the bacon flaps over, and add a strip or two of bacon so that the middle is covered up. Next day. Preheat oven and put terrine in a roasting pan and fill pan with water. This is called a bain marie, or water bath. Cover our little friend with a double layer of foil. And let him cook for a couple of hours, until he reaches the correct temperature–155 to 160*. Stick him on a rack and let him continue to cool for another half hour. Now, it’s time for weighting the terrine! And being the idiot that I am, I forgot to capture it on “film”. So here’s a nice picture that I stole from the internets, it’s probably prettier than anything I would’ve taken anyway. First put your terrine on a clean baking sheet. Cut a rectangle of cardboard the size of your terrine mold and wrap it tightly in foil. Set it on top of your terrine and put heavy stuff on top. Since mine is long and skinny, I used 4 15-oz. cans of random beans. Go out to dinner now, or just forget about it for a few hours, then you can remove the weights. But–leave it in the fridge for another day or two. To unmold, put the baking sheet and all in the sink and fill it with hot water. Let it sit for a minute or two, run a knife around the edges, and flip it onto a board. As you can see, it’s a little gunky, from the melted fat and whatnot. Do not let this disturb you, just wipe it off with paper towels till it’s nice and dry. Let sit out for about 30 minutes before serving. Slice thinly and serve with strong Dijon mustard and cornichons. I added a salad and some zucchini pickles (recipe tomorrow). Freeze meat and grinder parts for 20 minutes so they are very cold. Cut meat and fat into small chunks, add liver and mix together. Position a bowl in a bowl of ice below the grinder for the meat to fall into. Grind meat, fat and liver together. Put bowl on ice into the fridge to stay cold. Cook onion in butter until soft over medium-low heat. Add garlic and thyme and cook for another minute. Transfer to another bowl over ice. While the onion is cooling, gring salt, black peppercorns and spices in a small food processor or spice grinder. Add to onion mixture. Whisk in cream, eggs and brandy until well combined. Add meat mixture to onions and cream. Add ham cubes and green peppercorns. Mix with your hands until well combined. Do not overmix. Line terrine mold crosswise with bacon, but do not overlap. There will be an overhang on both sides. Fill terrine with the meat mixture, tapping the terrine on the counter to compact and eliminate air bubbles. Cover the terrine lengthwise with another strip or two of bacon, then flip the overhanging bacon pieces over. Cover terrine with plastic wrap and chill 8 hours to marinate. Preheat oven to 325*. Place oven rack in middle position. Discard plastic wrap and cover with a double layer of foil. Bake terrine in a water bath until thermometer inserted diagonally through foil at least 2 inches into center registers 155-160*, about 1 3/4 or 2 hours. Remove foil and let set on a rack for 30 minutes. Put terrine on a clean baking sheet. Place a clean sheet of wax paper or parchment over terrine and then cut a same-size piece of cardboard and wrap it in foil. Place on top of the terrine. Weight with cans of food or a clean brick. Chill terrine with weights about 4 hours, or until completely cold. Continue to chill terrine at least another day. Run a knife around the terrine edges and fill the bottom of the baking sheet with hot water. Tip mold over to drain excess liquid, holding the terrine so it doesn't fall. Invert onto a board. Gently wipe off the outside of the terrine with paper towels. Let stand at room temperature for 30 minutes before serving. Slice into 1/2 inch slices and serve with strong Dijon and cornichons. Note Terrine can be kept, wrapped in plastic, up to 2 weeks.